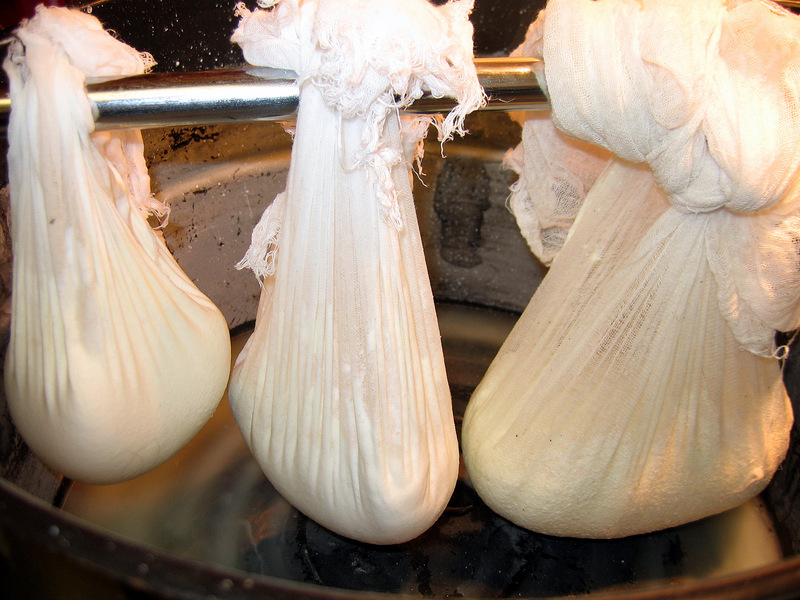 Cheese – milk’s leap toward immortality. “Why don’t more people do it? Is it because they don’t know how easy it is? 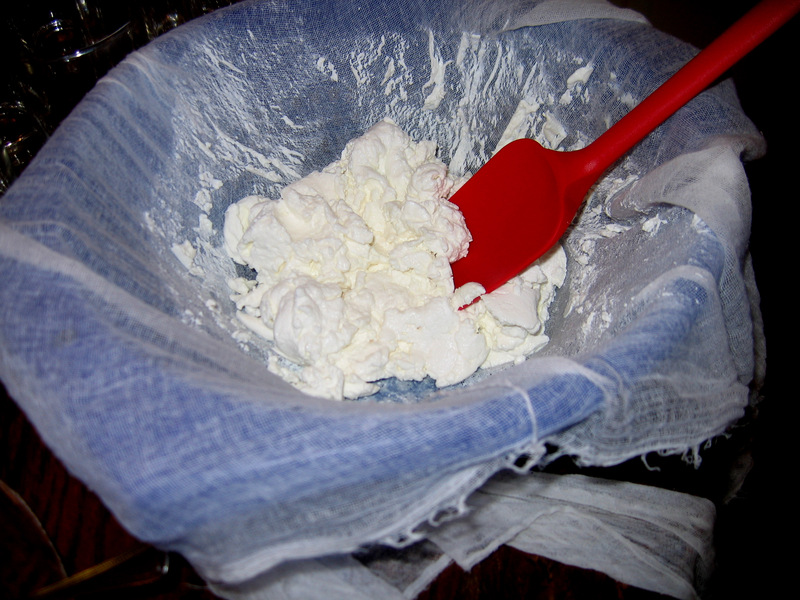 Why would you continue to pay so much more for stuff you can make in a few hours and have fun while doing it?” These were the questions that were running around our heads while my wife, Kathy, and I drove home from the Off the Vine sponsored Cheese Making 201 class on Saturday. Led by the dynamic duo known as 2 Girls and a Hammer, we were instructed on the methods for making chèvre, ricotta, ricotta salata and yogurt. This wasn’t a class as much as it was a workshop, and not so much a workshop as it was a playground. Here, however, the swing sets, teeter totters, slides and monkey bars were replaced with pots, strainers, thermometers, a cheese press and this totally cool grippy thing for taking glass jars out of hot water, known in canning circles as simply a “jar lifter.” (I think they really missed the boat on this one and a title like The Extracto 2000, with the tag line “You can’t can without it” would move the product like crazy.) The “Girls” weren’t so much teachers as they were gurus, sharing their cheese wisdom with eager disciples who had come in search of the secret to turning a pot of milk into a pot of cheese—the dairy version of alchemy. Kathy and I found ourselves surrounded by a small group of kindred spirits. There was talk about the benefits of cooking with locally-sourced foods, there was a consensus that Barbara Kingsolver’s book Animal, Vegetable, Miracle should be required reading for all Americans, and it was unanimous that homemade Greek yogurt rivaled even the most pricey store bought version. I think that a majority of the folks in attendance even thought that owning a goat, if for no other reason than to get its milk to make chèvre cheese, was an awesome idea. Tasting the fruits of the Girls’ labor, full mouths mumbled with approval. The chèvre was mild and creamy in texture and the ricotta stood strong and tasted great next to a slice of sausage. The yogurt was smooth and velvety and cried out for ingredients like fresh fruit, honey, vanilla and, as Tess from Off the Vine commented on more than one occasion, chocolate. “I think most people would try making cheese at home if they had someone to show them how easy it really is,” said Kathy, as we got closer to home. “Maybe that should be the focus of the blog we’ll write for Off the Vine,” I responded, “I even have the title.” “Oh yeah,” Kathy replied with both a knowing and skeptical look. “Yeah, how about It’s So Easy Making Cheesy?” After a long pause, that I have learned from experience means there was no way that was going to be the title, Kathy just shrugged her shoulders and wrinkled her nose. If I wasn’t still on a cheese buzz, I might have argued the point, but we had already shifted gears to planning the meal of baked polenta with kale and cheese (see recipe below) using fresh ingredients from Off the Vine and our homemade cheese. “We can add the recipe to the blog,” Kath pointed out. “Great,” I replied, “then we can use the title The Little Curd that Could” . . . shoulder shrug and nose wrinkle, “or, You Gotta Love Ricotta”. . . shoulder shrug and nose wrinkle, “Cheeses that Pleases”. . . shoulder shrug and nose wrinkle, “Stars of the Milky Whey”. . . shoulder shrug and . . .
Preheat over to 350F. Lightly oil 2-quart glass baking dish. Heat oil in heavy large deep skillet over medium heat. Add onion; sauté until tender, about 15 minutes. Stir in garlic and crushed red pepper, then kale; cover and cool until kale is tender, stirring occasionally, about 6 minutes. Uncover; stir until any excess liquid in skillet evaporates. Season with salt and pepper. Meanwhile, bring 3 1/2 cups water and salt to boil in large saucepan. Gradually stir polenta into boiling water. Reduce heat to medium-low; simmer until polenta is very thick, stirring frequently, about 10 minutes. Remove from heat. Whisk ricotta and eggs in bowl; whisk in 1 cup hot polenta. Stir ricotta mixture into polenta in saucepan. Spread half of polenta mixture in baking dish. Spread half of kale mixture over. Sprinkle with half of mozzarella. Repeat layering with remaining polenta, kale, and cheese. Bake until puffed and brown on top, about 45 minutes. Cool 30 minutes. Glad you had fun! I was a little afraid we tried to squeeze too much in one class so I’m glad you took so much away! Like us on Facebook for Store Specials & Updates! Off The Vine Market, Inc.